Spanish mariner, born in Novelda, near Alicante, 5 January, 1713; died in Madrid, 21 June, 1773. At the age of twelve he entered the Order of the Knights of St.John (Malta) and after campaigns in Africa was admitted to the Royal marine guards, studying mathematics and astronomy at Carthagena. He was entrusted, at the age of twenty-two, with the command of a corvette, in which he made several voyages to America. In 1735 he accompanied Ulloa & La Condamine to Peru to execute the measuring of the arc of the meridian at the equator. The heights of the Andes mountains were measured successfully by means of the barometer on this expedition thanks to his scientific expertise. On his return to Spain he became closely involved in the reorganization of the Spanish navy. In addition he wrote several works on navigation. 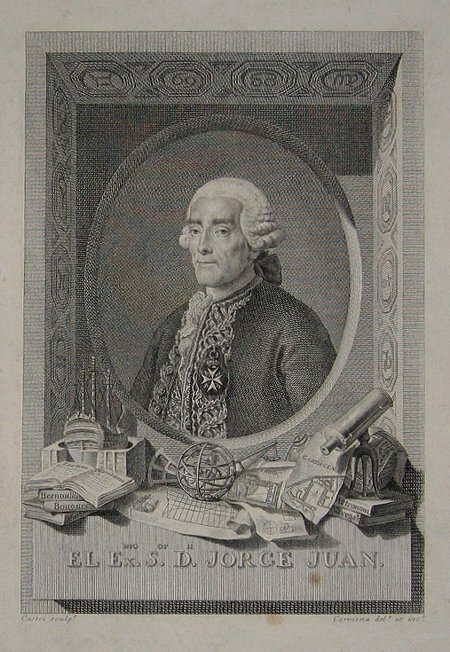 Other works included Observaciones sobre astronomia y fisica, hechas en el Reino del Peril por Don Jorge Juan y Don Antonio Ulloa [Madrid, 1748; French translation, Amsterdam and Paris, 2 vols., 1752]; Disertacion historica sobre el meridiano de demarcacion entre los dominios de Espana y Portugal [1749, French translation, Paris, 1776]; and Estado de la astronomia en Europa .